Our new UV Flatbed Printer covers 100m in stunning graphics faster than anything else. The new Ricoh Pro T7210 UV flatbed is the ideal platform when printing onto a wide range of substrates requiring flexible ink with excellent adhesive properties. Wood, glass, metal and so on. Print to versatile applications. High reliability. Ease of use. 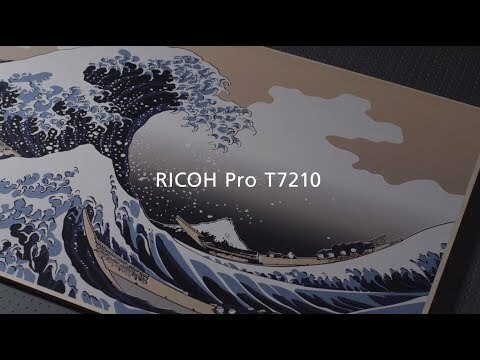 Video: Ricoh Pro T7210 is optimized for the Industrial Decoration sector offering high productivity and versatility for printing on rigid and heavy materials such as glass, wood, steel, up to 11cm of thicknesses. Ricoh Pro T7210 is optimized for the Industrial Decoration sector offering high productivity and versatility for printing on rigid and heavy materials such as glass, wood, steel, up to 11cm of thicknesses. Print to versatile applications: banner, self-adhesive, film, textile, wood, glass, metal and so on. Ricoh’s specially formulated UV ink is designed to meet the wide range of customer requirements in decoration and signage. The ink is flexible with excellent adhesion* suitable for post processing, shaping and bending into its final design. Produce appealing advertising posters and promotional displays or big, bold building covers and banners that captivate passers-by and boost visibility for your customers. Point-of-sales, indoor, outdoor and exhibition graphics – all covered. Add broad application range focused around the interior decoration and building materials, especially rigid and heavy, including glass, wood, aluminium composite and metal. The EFI™ Pro 16h LED UV hybrid inkjet printer has been strategically designed with a complete package of features to assure the low total cost of ownership, superior image quality and access to the widest range of substrates/applications.